Twitter Search continues to impress me. It’s quickly becoming one of the best things about the service. I woke up this morning and noticed that my Feedburner/Google subscriber count had plummeted from around 900 to around 400–a drop of 500. Content creators don’t like that because it makes you start wondering what you did wrong. Was it that picture I posted? Have I been too heavy on religion lately? 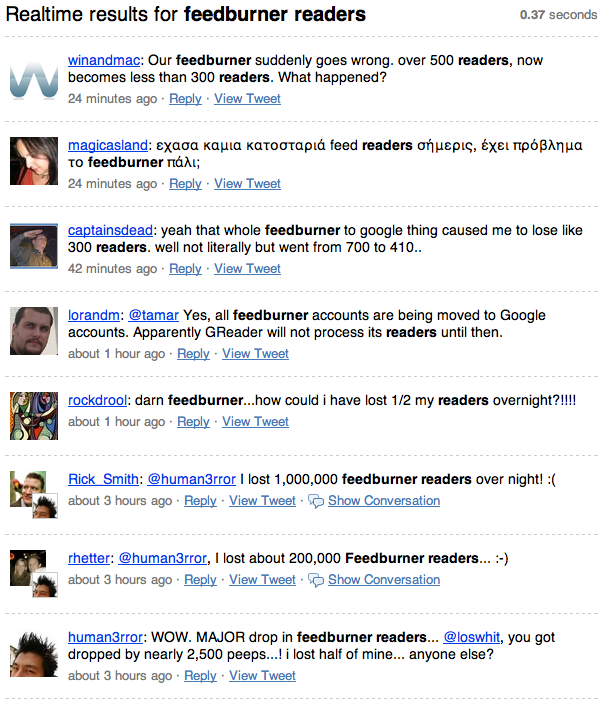 So I fire up Quicksilver and run a Twitter Search (screencast forthcoming) on the word “feedburner”. Instantly I get back hundreds of people asking the same exact questions, which confirms my theory that there’s been a glitch with the subscriber numbers at Google. This is power. No, this is serious power. Never have we been able to so easily figure out if the “world” (by sampling) is having the same problem you are, or what “people” are talking about.